A lacy crochet kimono has been on my mind for quite some time. I was waiting for the weather to get warmer so I can play with colors and lightweight yarn. 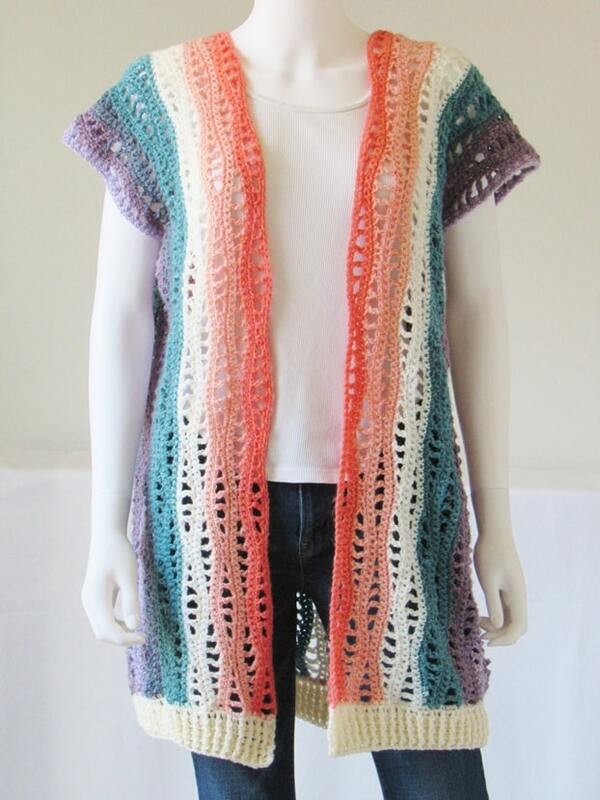 The sample kimono is made from Lionbrand Mandala yarn that I picked up when we visited Lionbrand Yarn Studio in New York. I think I quite like how these turned out. The pictures don’t capture the real beauty of the colors. 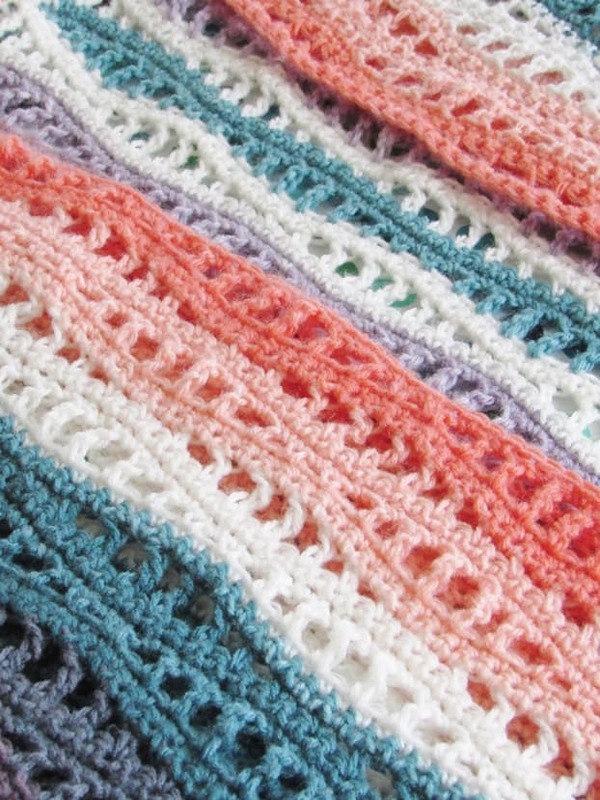 The lacy wave stitch I used for this crochet pattern is easy to memorize and is perfect for spring or summer. Don’t you think? You can work from the written pattern below or purchase the pattern for $2.50 here. 1. DK weight yarn in 2 colors. I used Lionbrand Mandala in colorway Pegasus for the body and Baby Bee yarn in color Naked for the bottom ribbing. 2. Hooks K (6.5mm) and H(5mm). 3. Tapestry needle to weave in the ends and seam the sides. 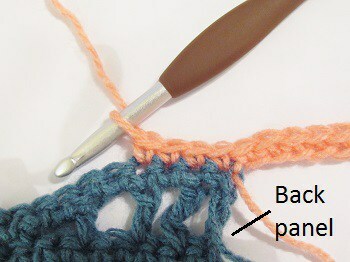 All sizes are 32 inches long from the shoulder to the end of the ribbing. S and M: 3 skeins of Lionbrand Mandala and 120 yards of the yarn for ribbing. L and XL: 4 skeins of Lionbrand Mandala and 200 yards of the yarn for ribbing. 2XL and 3 XL: 5 skeins of Lionbrand Mandala and 250 yards of the yarn for ribbing. You will have some yarn left over if you are using Mandala. If you are using a single color yarn you might only need 1700, 2100 or 2500 yards, not including the ribbing. With bigger hook and the yarn you picked for the main body, ch 50. 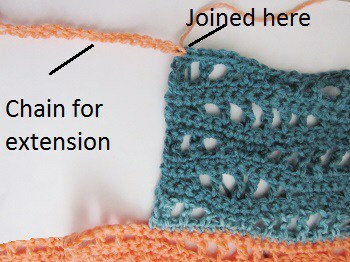 Follow the pattern for the left panel below until you have 6 wave rows and measure for gauge. 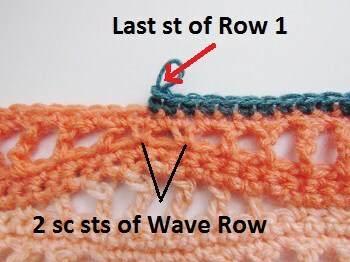 4 wave rows with sc rows on either side= 4 inches. Each pattern repeat adds 1 inch. 1. This kimono is designed to be loose fitting. 2. The kimono is worked in three sections, the left panel, the middle panel and, the right panel. The panels are continuous and NOT worked separately and sewn together. 3. Every skein of Lion Brand Mandala yarn is wound differently even if you purchase the same dye lots. If you have the purple outside on some skeins, you might have it on the inside on others. To ensure that the right side of the kimono looks the same as the left side, you might have to change colors to mirror the color changes when you are making the right panel. 4. The Kimono is worked from side to side or armhole to armhole. First, you work a very long left panel, then add a back panel that runs half its length, and then the right panel which is the same length as the left. With the bigger hook, Ch 210. 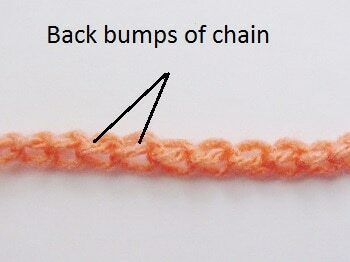 If you want to increase the length of the kimono, you can add multiples of 32 to this starting chain of 210. Every 32 chains added will increase the length by around 4-1/2 inches. Ch 3 is used as the turning ch and not ch4. This is done intentionally to keep the gap between it and the next tr small. If you chain tight, you might find that ch-4 works better. To keep track of your wave rows, check if the 2 sc sts are aligned on top of the 2 tr sts of the previous wave row as shown in pic 2 below. 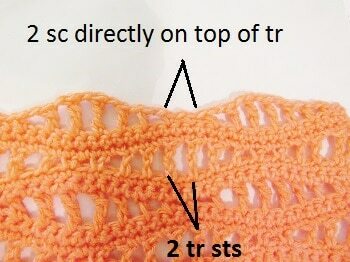 Variation in stitch counts are given in the order S(M, L, XL, 2XL, 3XL). If only 1 number is given, it applies to all the sizes. Repeat Row 2-7 until you have 10(10, 12, 12, 14, 14) wave rows and you end in a repeat of Row 5. Work 1 more repeat of Row 6 to complete the left panel, and when you work the last st, join the color for the back panel after reading the note below. Turn. The completed left panel is approximately 10(10, 12, 12, 14, 14)inches wide. 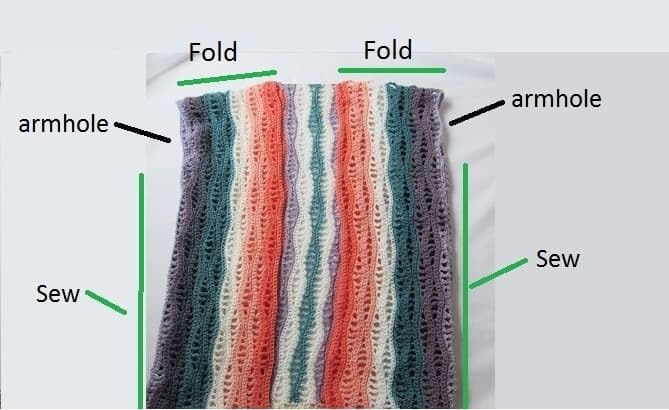 The following instructions don’t apply if you are using a single color yarn or you don’t care if the right and left front of your kimono have color variations. Before you start your back panel, make sure you keep aside enough yarn in the right colors to make your right panel just like your left one. Depending on the skein you got, you might have to separate the colors from it and wind them into individual balls. I noticed that even if all the skeins of one colorway had the same color, they varied slightly in length too. So for my back panel, I took care to use colors I had extra of. The back panel is a very narrow piece that is only half as long as the left panel, so you don’t need a lot of yarn for it. Note: Your last sc will be between 2 sc sts of the previous Wave Row as shown in pic 3 and it will be at the middle of your left panel. Repeat Rows 2-7 until your back panel has 5(6, 4, 5, 4, 5) wave rows. Repeat Row 6 one more time to complete the back panel and join the color for your right panel, turn. For your right panel, remember to mirror the colors of your left panel as far as possible. The completed back panel is 5(6, 4, 5, 4, 5)inches wide. 1. For these 3 sizes, your working yarn will be at the hemline now. 2. When you work into the chains added for the extension, you work into the back bumps of your chain to leave the “V” of your chain free to work into, see pic 4 below. 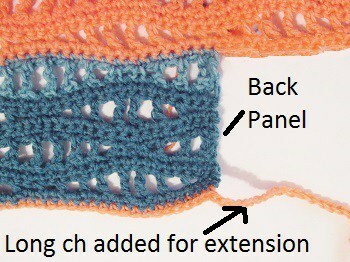 Row 2: This row is worked starting from the tip of your single crochet extension towards the back panel as shown in pic 7. 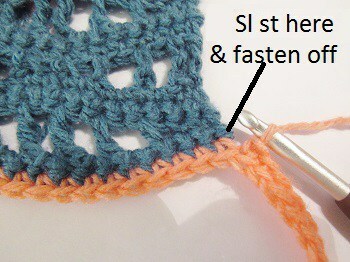 Join yarn with a sl st to the first sc, ch 1 and repeat Row 2 of the left panel. It will extend all the way to the hem. Row 3-7: Repeat Rows 3-7 of the left panel. 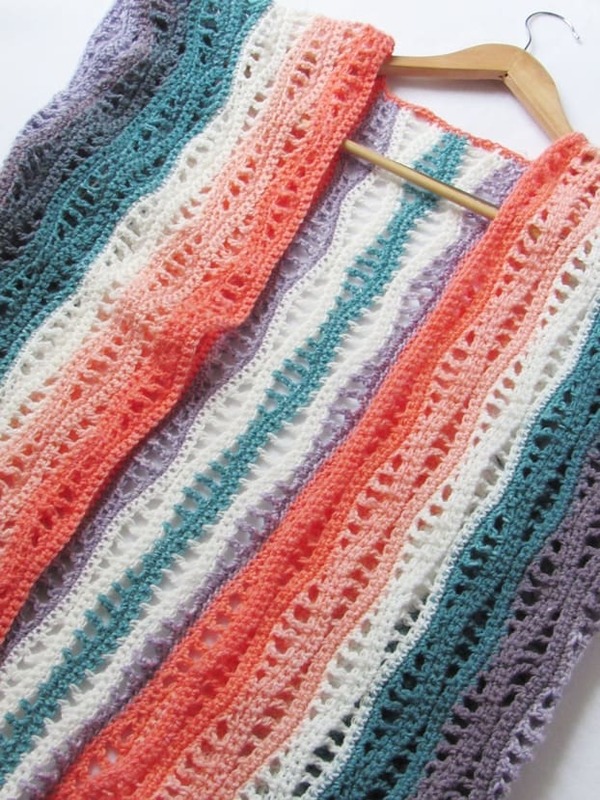 Repeat Rows 2-7 of the left panel until you have 10(12, 14) wave rows for sizes M(L, 2XL). Work 1 more repeat of Row 6 to complete the right panel. Fasten off. NOTE: Your working yarn will be at the neck edge for these 3 sizes. Rows 2-4: Repeat Rows 5, 6, and 7 of the left panel. Now keep repeating Rows 2-7 of the left panel until you have 10(12, 14) wave rows for sizes S(XL, 3XL). Work 1 more repeat of Row 3 to complete the right panel. Fasten off. Fold the two extensions to the front with the wrong side out as shown in pic 10. You can choose whichever side you want as your wrong side. Seam the sides with a whip stitch leaving a gap for the armhole based on the measurement chart below. Sl st to the base of your left panel and work a row of sc up along the side of the left panel, along the back neckline and down the side of the right panel. Fasten off. Row 1: With smaller hook and cream color DK weight yarn, sl st to the base of your kimono, work a row of sc along the hem, I worked 1 sc across each sc row and 3 sc sts across each ch-3 or triple. Turn. You should have an even number of sts at the end of this row. Row 2: Ch 3 ( counts as a dc here and throughout), 1 dc in each st across to end. Turn. Row 3: Ch 3, *(1 fpdc in next st, 1 bpdc in next), repeat from * to beg ch-3, 1 dc on top of beg ch-3. Turn. Row 4: Ch 3, *(1 fpdc in next fpdc, 1 bpdc in next bpdc), repeat from * to beg ch-3, 1 dc on top of beg ch-3. Turn. Repeat Row 4 until ribbing measures 2 to 2 1/2 inches. Fasten off. 1. With cream color yarn and smaller hook, ch for a length of 44 inches and fasten off. 2. Make 2 tassels. 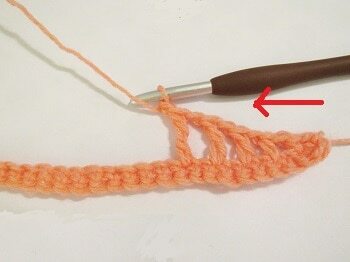 You can see a tutorial on making tassels here. I used 3-inch wide cardboard and wound the yarn around it 11 times to make a thinner tassel. 3. Tie the tassels to the ends of your chain. Pull the remaining tails through the tassel and trim. 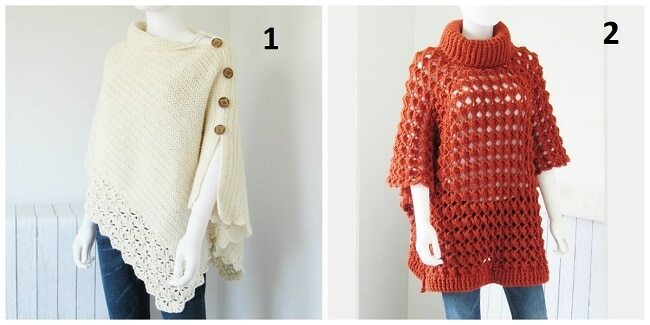 If you love making crochet clothing, check out my free poncho patterns. 1. 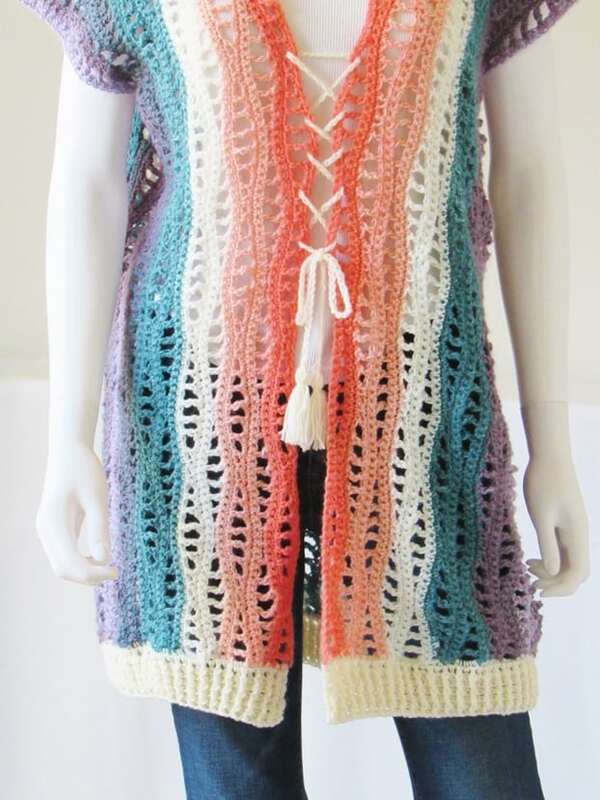 Uptown Crochet Poncho 2. 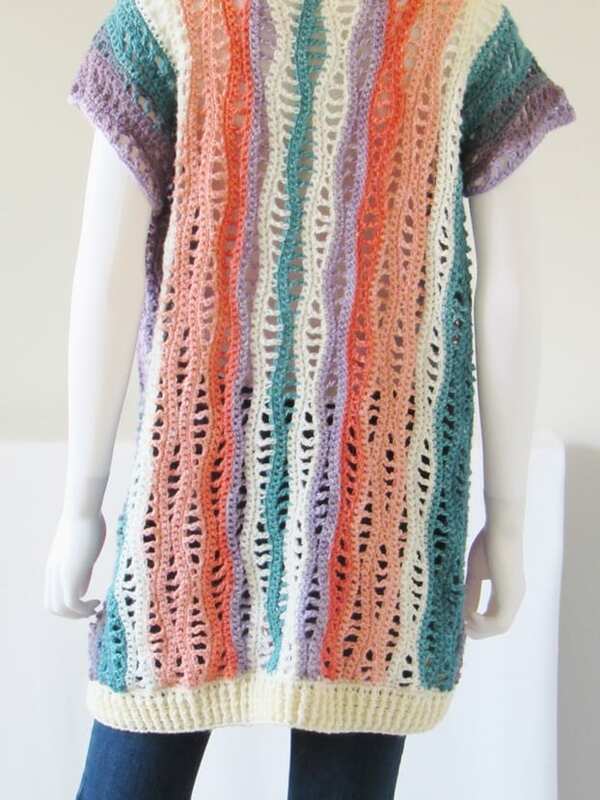 Elise Crochet Poncho. 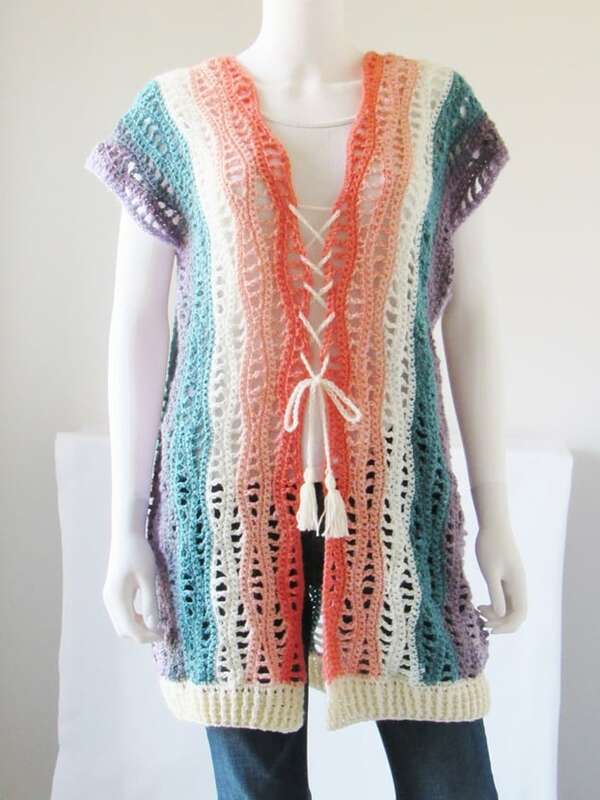 You can find more such free patterns on Allfreecrochet.com. Would like to make, but don’t understand the construction. Why is the back panel half as short as the other panels? What does it look like from the back? It’s short in the back and long from the front? TY. The left and the right panels extend from the front all the way to the back hem. The back panel, well, is only at the back. Please take a look at Pic 1. The back and front are the same lengths. You can see the back view in one of the pictures at the top. Beautiful pattern! Thank you so much for sharing. Love the poncho! How many skeins of yarn did you use? Please look under yardage to fond the yarn requirements for each size. 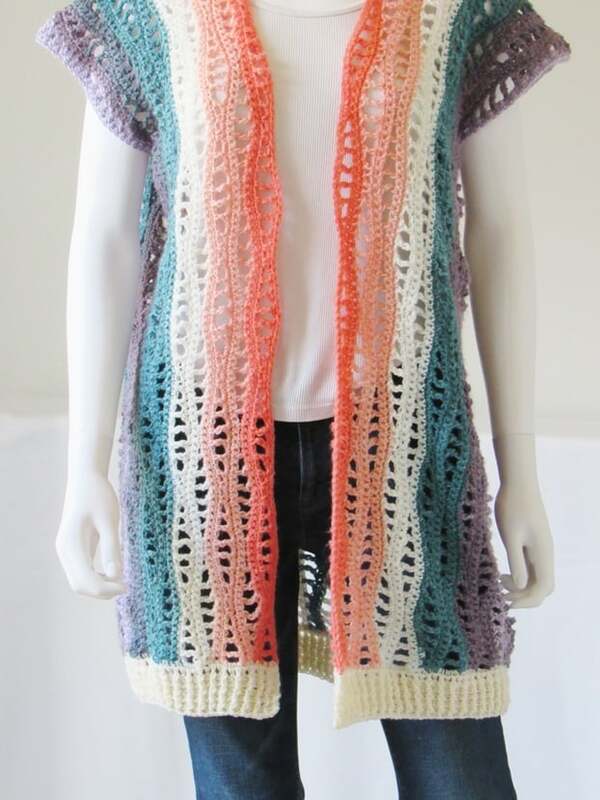 It’s a lovely vest or cardigan. I’m having trouble seeing why you are calling it a kimono. If you are inspired by Japanese clothing, perhaps you are thinking of Haori, the open jacket worn over kimono. I understand that fashion has run amok with loose layers and calling them kimono, but if you are going to name a design after a piece of traditional clothing from a heritage that is not yours, it behooves you to do your research and be sure you are being respectful and naming the piece correctly. I really love this, LOVE YOUR WORK wish I could make it.. I just dont know how to read written patterns i am more of a visual learner..! Hi Naomi, I am sorry I do not have a video. I have included lots of pictures in the written pattern. Hope that would be helpful. Curious on the right panel there is not a #3 is this missing? Hi Vicki, I checked and couldn’t find anything missing. Am I overlooking something? Could you please clarify? What is missing under notes?